Popular culture treats the rainbow as the paragon of colour in nature—and, it certainly is spectacular. But so is the corona. Yet, few speak, or even know about it. And it is not as if the corona were rare, indeed, it occurs, if anything, more frequently than the rainbow. But, it is not as frequently seen, for the corona can have not only dazzling colour, but dazzling brightness—and therein lies the problem. When the corona forms, it is very close to the Sun and is exceedingly bright. The name, corona, just means crown; it is a crown (of light) worn by the Sun. In a way, these pictures of coronae have a somewhat deceptive scale, at least when viewed alongside the images of haloes and rainbows. Those pictures relied upon very wide angle views. After all, the rainbow’s diameter can span nearly a quarter of the 360° horizon—it is really large. But, the corona, although variable, might only be 6° in diameter; it is quite small. That distinction is not apparent in pictures such as these which use a wide angle lens for the rainbow and a telephoto lens for the corona. So, the corona, is dazzlingly bright, and close to the Sun. No wonder people rarely spot it. 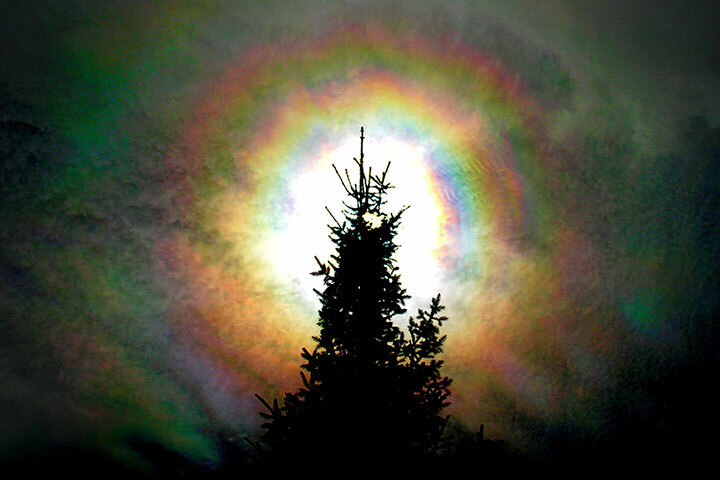 Coronae are explained by the diffraction of sunlight (or moonlight) by small cloud drops. What one sees depends upon the size the drops, how much variation there is in drop size at a particular point in the cloud, and how the drop size and local variation changes from one place to another in the cloud. The clouds which give the most spectacularly colourful corona are the (mountain) wave clouds (also known as lenticular clouds) because the drop sizes are nearly all the same. Coronae can be seen from around the Lake at any time of year, but as the nicest ones form in wave clouds, prime viewing is when such clouds are frequent. Wave clouds probably form most often in the winter, but that is also the season when stratus often fills the valleys and so the wave clouds riding above the mountain tops are not visible unless, say, one is up on the ski hill. 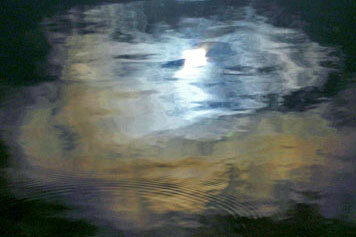 Fall, however, is a good viewing time: good wave clouds form frequently and can usually be seen. Look for smooth clouds in the vicinity of the Sun, but use sunglasses or some other means of cutting down the brightness, or the eye will not detect the colour amidst the dazzle. Corona The Sun is surrounded by a variegated series of pastel rings. A tree was used to block the overwhelming brilliance of both the Sun and the cloud in its immediate vicinity. With increasing distance from the Sun the repeating colours become fainter and then vanish into the relatively darker (underexposed) sky. This is a scene to rival astronomical shots of exploding stars, and yet it is visible right here along the Lake with nothing but sunglasses as an aid. Corona and uniform cloud drop size Some wave clouds have a remarkably uniform population of cloud drops: not only are they all the same size in each small region, but they are also the same from one region to the next. Under these circumstances, the corona is a simple series of coloured rings: bluish to the inside near the Sun, reddish to the outside, a pattern which is repeating getting fainter and fainter farther from the Sun. One solution to the dazzling brightness of the corona is to look at its reflection in the Lake: although still bright, it is greatly dimminished. 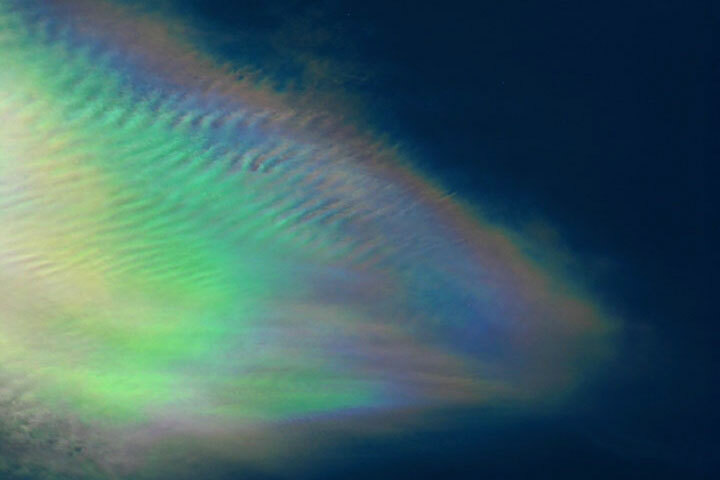 Iridescence is the name given to irregular patches of the corona seen in a cloud that is some distance from the Sun. 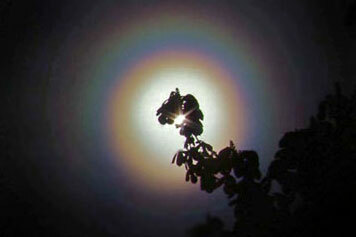 The colour in the corona depends upon the angular distance from the Sun and the size of the cloud drops. Sometimes when the cloud is off to one side of the Sun, rather than being centred around it, the colours are more sensitive to drop size than angular distance. As air flows through a wave cloud the drops grow from the edge to the middle and this produces coloured bands along the edges of the cloud almost contouring the changing drop size.